When Vanessa moved to Los Angeles in 2009, she was faced with gravel — a lot of it (Figure 4). Being in Southern California, under the rock was clay hardened by time and, presumable, weight of cars that had used the space as a parking lot. However, Vanessa noticed a benefit: the gravel retained water after a rare rain leading to extra growth along the garden bed edges (Figure 5) and volunteer chard plants growing amongst the gravel itself. During their visit to the garden, Joline, Jon, and Vanessa discussed a permaculture principle on waiting and watching: noticing where plants succeed over time and on their own can communicate to gardeners where a new bed should be made. Applying this principle, landscapes can also work with the path of the sun or follow insect pollination patterns. Also in 2009 Vanessa began working at the Los Angeles County Natural History Museum where she met local food organizer Florence Nashida and together helped build the museum’s first demonstration edible garden. 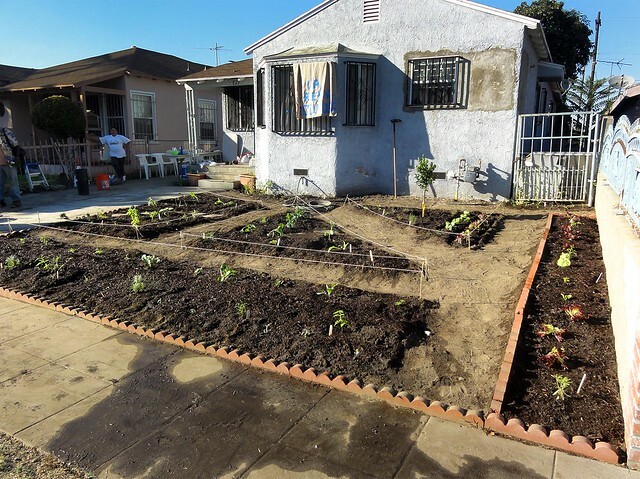 In 2010, Florence enlisted Vanessa and others to see how they could scale lessons learned from working in their own gardens to residents across Los Angeles. 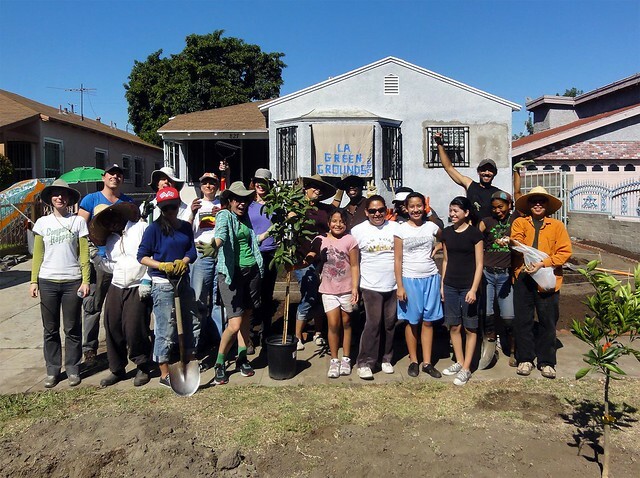 The result is LA Green Grounds, a volunteer corps that converts water-gulping lawns into food-providing edible gardens on weekends once a month (Figure 6). 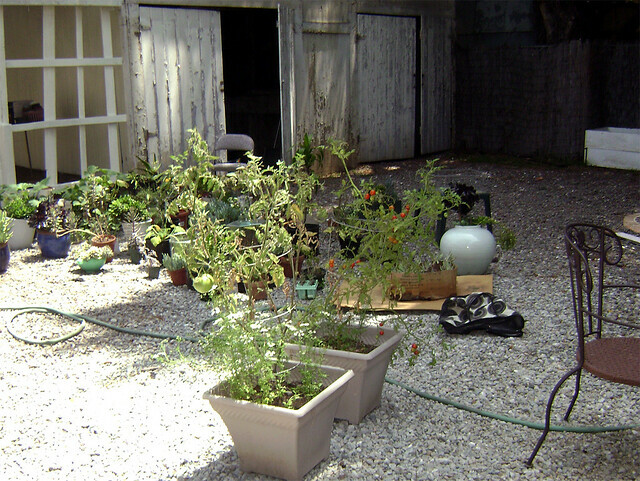 Applying permaculture principles that foreground sharing, LA Green Grounds focusses on teaching; the group shows up with shovels and pick axes, but also California Master Gardeners to teach residents and volunteers about creating and maintaining edible landscapes in LA (Figure 7). Documentarians Jackson Stakeman and Kelly McColl recently captured their path to becoming LA Green Ground volunteers and establishment of a new South LA garden in a recent video posted on YouTube. 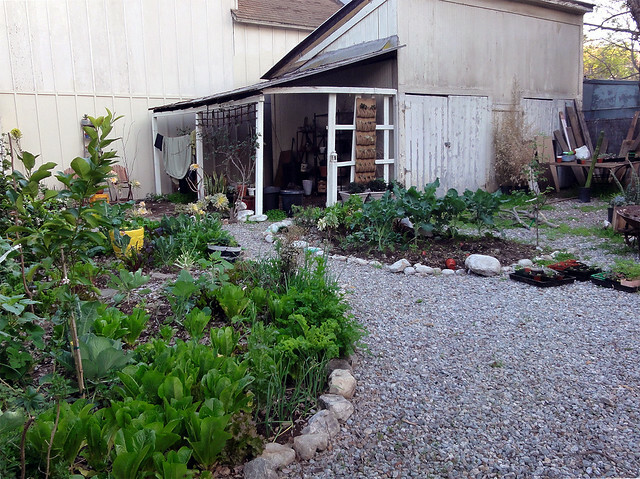 Groups such as LA Green Grounds and activities like DIY gardens are part of a growing push to reshape Los Angeles stereotypes based on permaculture rather than car culture. Known as a city with high water consumption, Vanessa’s water-capturing gravel reduces her use out of the hose. After research from their first demonstration garden, The Natural History Museum is presently building a permanent — and much larger — garden wrapping the North side of their campus which will produce food for volunteers and staff. And all residents of Los Angeles County are involved in a massive effort to build thirty years worth of light rail lines in ten years funded by Measure R sales tax. On their visit Joline and Jon got around on bikes that, naturally, Vanessa had acquired via CraigsList.